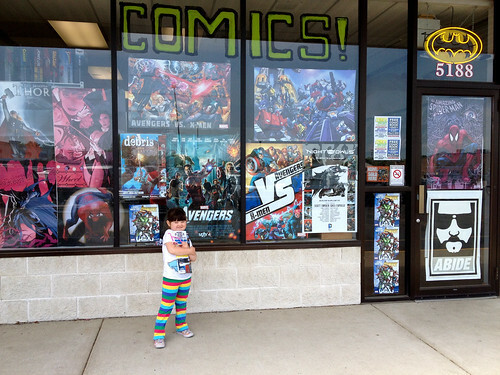 I absolutely love how excited my daughter gets about Free Comic Book Day. There was quite a haul this year in high-quality, kid-friendly titles, as well as stuff like the Star Wars/Serenity double-feature for me. And heck, she was the one who squealed when she saw the Star Wars book and ran to get one for me, so it might as well be for her too. I had my hands full inside the store so nothing really came of those photos, but once we were outside I got her to pose with her loot, which she did with pride and the pure joy that only a young child can express so perfectly.